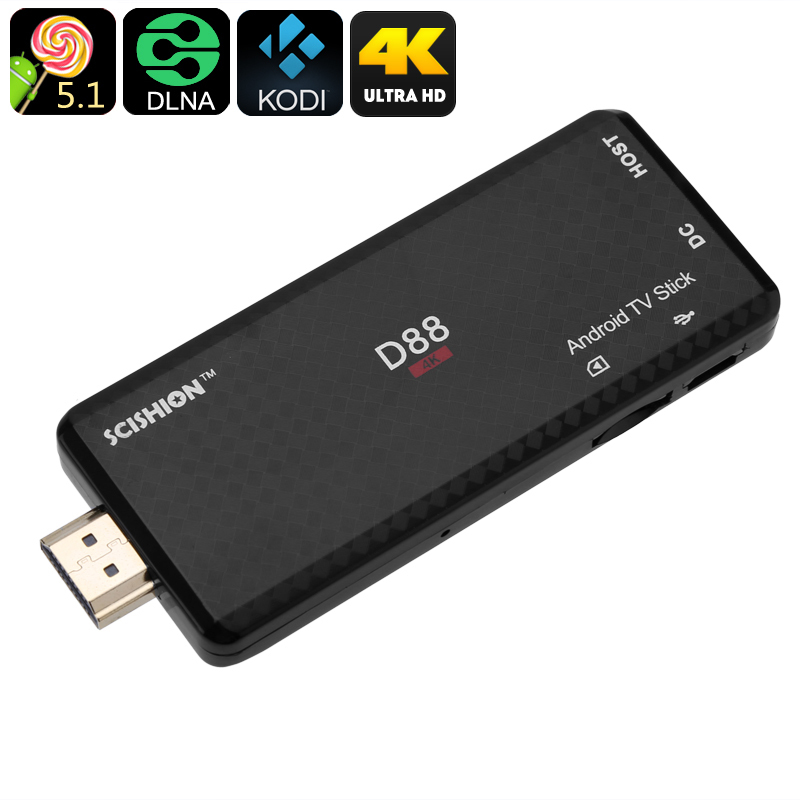 Successfully Added Android TV Stick Scishion D88 - Android 5.1, Quad-Core CPU, Bluetooth, DLNA, Google Play, Kodi 16.1, WiFi, 32GB SD Card Slot to your Shopping Cart. The Scishion D88 TV Stick allows you to efficiently turn your regular HD TV into a high-end Android Smart TV that comes packed with an unlimited source of fun and joy for you and your family to enjoy. With its Android operating system, this TV stick allows you to play games, stream movies, and download the latest TV applications straight from your big screen television – truly bringing along a magnificent media experience that is sure to meet anybody’s liking. Providing you with access to the Google Play Store and Kodi TV, a never ending pool of free entertainment lays at your disposal. Whether you like to spend a relaxing night at home with your wife and kids, or like to invite over all your friends and stream a live sports game – this Android TV box is guaranteed to leave a lasting and impressive experience that will bring hours’ worth of fun and joy into any modern household or office. Thanks to its ultra-slim and compact design, this Android TV dongle can be carried around effortlessly inside your pocket. The next time you go visit a friend’s place or head out on a week-long cottage trip in the forest, you’ll always be able to carry along all your videos, games, and mobile entertainment. Simply plug in the Android TV stick into any HD TV, and it will automatically turn it into one of those Android SmartTVs that you’ve always dreamt off owning. Packing a sophisticated Quad-Core CPU that has been clocked at 1.5Ghz, this portable Android TV dongle is capable of handling games, films, as well as Android TV applications without dropping a frame. 8GB or internal storage offers sufficient storage to save your favorite media whereas its 32GB SD card slots offer an additional space for you to store all those extra files and movies that you like to carry along. Capable of decoding 4K resolution, this Android TV dongle lets turn any room equipped with a television into your own private cinema. This Android 4K TV Box is the perfect smart home accessory for anybody out there that wishes to enjoy the benefits of owning an Android smart TV. With so many entertainment options, this Android TV dongle will make sure that you’ll never have to experience a moment of boredom again. This 4K Android TV Stick comes with a 12 months warranty, brought to you by the leader in electronic devices as well as wholesale electronic gadgets..